Actually the netbook DOESN'T have a DVD drive and so don't knock those portable DVD players! Also some of the cheaper portable DVD players are even cooler because they play divx/mp4s/mp3s direct from a USB or SD card. They charge from a 12V car battery and don't break when you put them in the hands of your 10 year old child. They come with TV cables and remote control (sometimes a bag too). If you want to just watch movies I'm not sure a netbook is such a great solution. and I have yet to purchase a netbook. 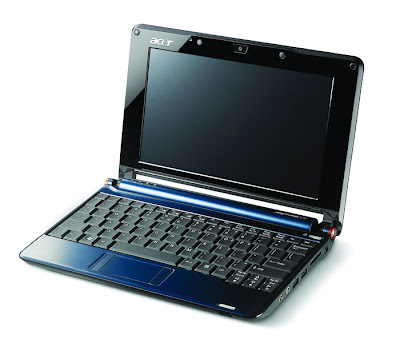 Though if netbooks were out at the time things would probably be different. If a netbook can play a standard definition movie then I'm all for it. I do travel from time to time and bring a portable DVD player with me. I don't have a laptop computer. It would be awesome if I could get a netbook in place of the DVD player so I could also grab email and use online maps and searches while in other cities that I currently use my Blackberry phone to do. You can also use NetDVD, see http://www.bluelionsoftware.co.uk. NetDVD allows you to play DVD movies, audio CDs, games and install applications on a netbook, and to burn DVDs. NetDVD adds a virtual DVD drive to your netbook, which connects to a real DVD drive on another computer on your LAN/WLAN. I found through testing on my asus eeepc 1005ha that VLC runs much more smoothly for all video types. I get 100% processor of death running h.264 optimized for iPhone when I run iTunes or quicktime...same video is using 16-20% of processor while running VLC. Tested 12 videos all full length movies at 750mb to 1.2gb in size. All looked great. them (on a plane) or wherever, they've worked fine..
of just watching an SD encode..
vlc has way too much overhead..
the 5xxx, 6xxx, and newer can all do it fine..
they have 10/12 inch form factors..
and there's a 5111 that is 10 inch..
they cost slightly more than a netbook..[if you get the right deal on ebay].. I have a Toshiba netbook and had jerky video playback on BBC iPlayer and ITVplayer. - The next issue is these are flash based sites. I right clicked on the video and selected settings. Click on the centre 'folder' icon and move the slider to the right for unlimited storage. Some improvement. - Next select the left hand 'display' icon and deselect hardware acceleration. There is no HW accelerator on the Netbook and Adobe help confirms that this causes conflict issues if selected without the accelerator present. Result is complete improvement and prefect full screen smooth video on BBC and ITV. Not sure if the previous adjustments are also still necessary but now very happy with video playback.